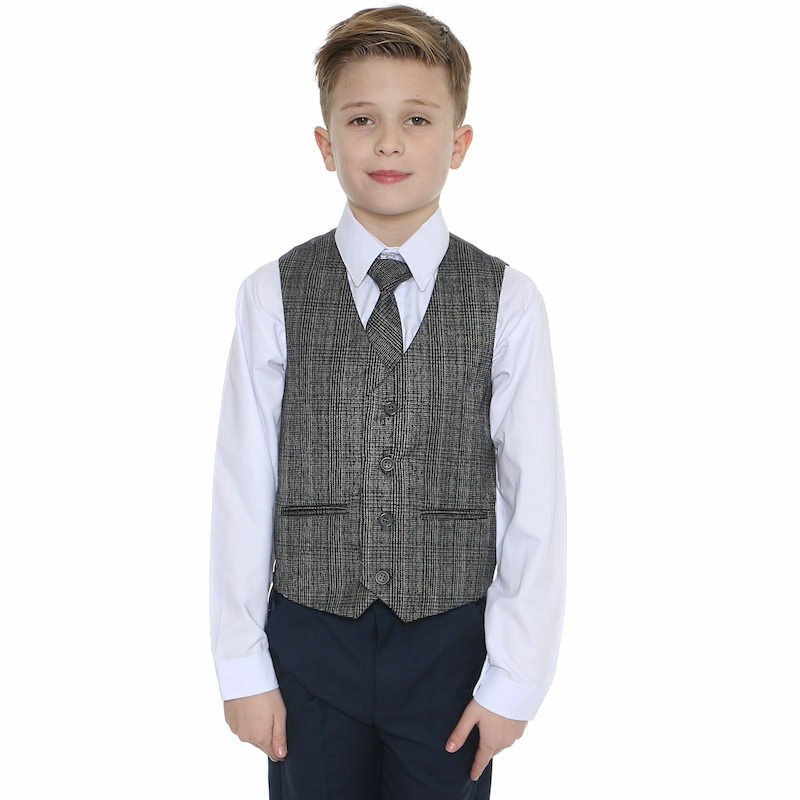 Navy & tartan tweed orange check 4 piece waistcoat suit for baby boys, toddler or older boy, suitable for all special occasions. 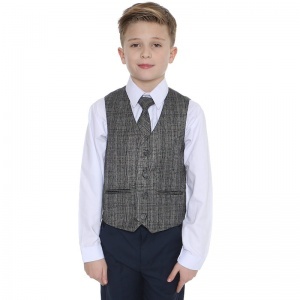 Waistcoat: Grey tweed effect waistcoat in a tartan pattern with a subtle orange check. Fully lined with double pockets, 4 grey buttons and an adjustable strap/buckle on the back for a perfect fit. Trousers: Pleated navy slim fit trousers, double pockets, belt hoops, elasticated on rear for the perfect fit. Shirt: Long sleeved white shirt, full-length centre buttons, buttoned cuffs, down-collar. 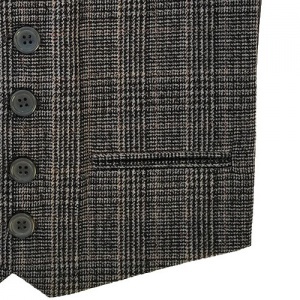 Tie: Co-ordinating with the waistcoat is a matching grey tweed effect tie in a tartan pattern with a subtle orange check. This suit is made of a light-weight fabric with a slim line cut giving a high quality, comfortable fit. Stitched to a high standard with great attention to detail. This navy & tartan tweed orange check outfit will make him look like the perfect handsome gentleman at a christening, wedding or special occasion. 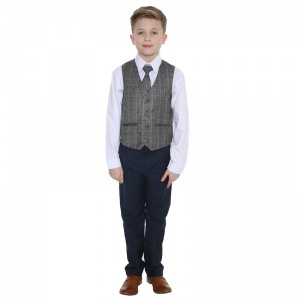 Sizes 3-6 months to 13 years - choose your own sizes for the perfect fit. 0-6 Months 32cm / 12½" 56cm / 22" 14cm / 5½" 22cm / 8¾" 26cm / 10"
6-12 Months 34.5cm / 13½" 58.5cm / 23" 14cm / 5½" 22cm / 8¾" 26cm / 10"
12-18 Months 35.5cm / 14" 59.5cm / 23½" 19cm / 7½" 26.5cm / 10½" 26cm / 10"
18-24 Months 38cm / 15" 61cm / 24" 20.5cm / 8" 28cm / 11" 28cm / 11"
2-3 Years 38cm / 15" 62cm / 24½" 23cm / 9" 30.5cm / 12" 28cm / 11"
3-4 Years 39.5cm / 15½" 63.5cm / 25" 25cm / 10" 33cm / 13" 28cm / 11"
4-5 Years 40.5cm / 16" 66cm / 26" 28cm / 11" 35.5cm / 14" 28cm / 11"
5-6 Years 43cm / 17" 71cm / 28" 30.5cm / 12" 38cm / 15" 28cm / 11"
6-7 Years 45.5cm / 18" 76cm / 30" 31.5cm / 12½" 39.5cm / 15½" 28cm / 11"
7-8 Years 48cm / 19" 81cm / 32" 33cm / 13" 42cm / 16½" 30.5cm / 12"
8-9 Years 49.5cm / 19½" 84cm / 33" 34cm / 13½" 43cm / 17" 30.5cm / 12"
9-10 Years 51cm / 20" 86cm / 34" 35.5cm / 14" 45.5cm / 18" 33cm / 13"
10-11 Years 53cm / 21" 91.5cm / 36" 37cm / 14½" 47cm / 18½" 33cm / 13"
11-12 Years 56cm / 22" 94cm / 37" 38cm / 15" 48cm / 19" 35.5cm / 14"
12-13 Years 58.5cm / 23" 96.5cm / 38" 40.5cm / 16" 51cm / 20" 35.5cm / 14"